Karen House : April 13, 2019, 10:47 p.m. The 2016 gray Chevy Equinox that Tyler Shell reportedly stole, lodged between two trees in rough terrain on Smith Mountain, where Shell abandoned it. Photo courtesy of Sequatchie County Sheriff's Department. UPDATE April 15, 2019, 6:30 p.m.: As of this morning, Tyler Shell was still in Erlanger Hospital in Chattanooga with a gunshot wound to one side of his upper torso. According to Sequatchie County Detective Jody Lockhart, the homeowner fired a round from a handgun, when Shell charged at him with a knife, with the bullet going in his chest and out his back near the shoulder blade. Shell is being guarded by a Sequatchie County sheriff's deputy while in the hospital, and will be transported to the Sequatchie County Justice Center when he is released from the hospital. Dunlap Police Chief Clint Huth said today that Shell will be charged with theft of a vehicle, aggravated burglary, and theft of property. 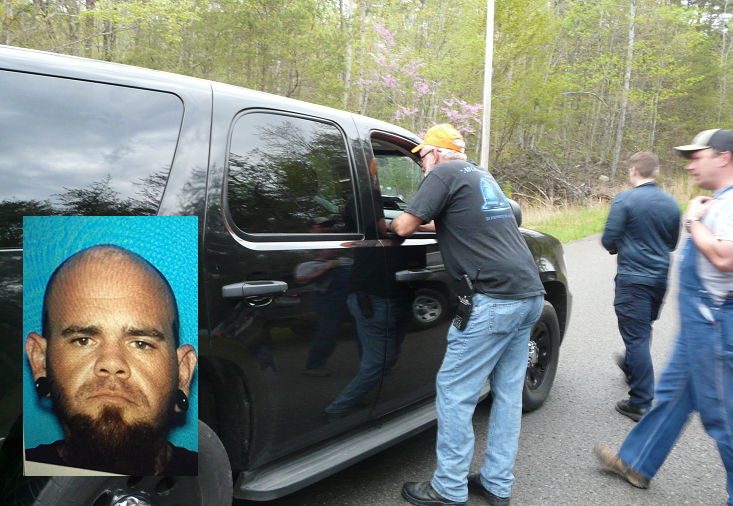 This incident that culminated in a four-hour manhunt on Smith Mountain began about 2 p.m. Saturday, when Shell's grandmother called police to report that he had stolen her 2016 gray Chevy Equinox from her home on Main Street. Shell had been living with her. About 45 minutes later, while city police were searching for the stolen vehicle, police received a second report on Shell. He had reportedly broken into the home of his aunt and uncle on Cline Circle while they were not home, taking about nine guns, including muzzle-loaders, rifles, and shotguns. An eyewitness put him at the scene, Chief Huth said. None of the stolen guns have been recovered, he added, and knowledge that Shell had possibly stolen firearms caused officers to approach the stolen car cautiously on Saturday evening, due to the suspicion that Shell was armed and dangerous. The woman who was in the car with him was identified as Shell's girlfriend, Amanda Davis, 23, of Soddy-Daisy. Since Shell was captured in Bledsoe County, Huth said the Bledsoe County Sheriff's Department may bring charges against him for the assault on the homeowner on Blue Sewanee Road, but Dunlap News has been unable to contact that department for any information about additional charges. April 14, 2019, 12:05 a.m. – Two different residents of Sequatchie and Bledsoe counties helped catch suspects fleeing officers in a stolen car. Tyler Shell, 32, of Dunlap, was arrested Saturday night after evading arrest for several hours. According to Sequatchie County Detective Jody Lockhart, Shell stole a vehicle inside the city limits of Dunlap and was pursued to Smith Mountain. When the car became stuck in a rough gravel road, it was abandoned, and officers of the sheriff's department and the Dunlap Police Department began searching the woods for the man, who was believed to be armed. 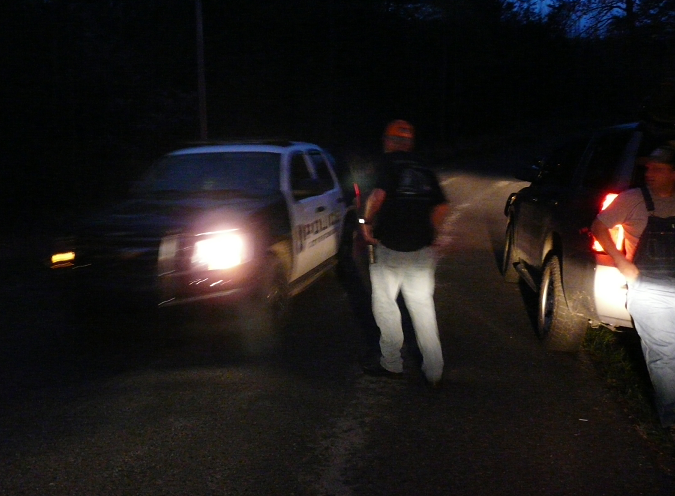 At their request, two K-9 units from Hamilton County assisted with the search. Residents of the community were cautioned to stay inside and keep their doors locked until the suspect could be apprehended. About 7 p. m. a homeowner on Windridge Drive said he was informed of the manhunt and was sitting on his porch guarding his house when a woman came out of the woods, wet from the creek and holding a Teddy bear. She said she had been in the car with the man the police were seeking. Emergency personnel waited at the entrance to the area with an ambulance, in case it was needed, and stopped any through traffic while police searched the woods for Tyler Shell (inset). The homeowner detained the woman and notified authorities, who took her into custody. At about 8:15, officers received a call from a citizen who lives on Blue Sewanee Road. He told police that as he was standing on his property a man “charged at him,” Det. Lockhart stated. When officers arrived, they carried Shell to meet medical technicians who treated him and transported him to Erlanger-Sequatchie Emergency Department with non-life-threatening injuries. Because this last action occurred just over the line in Bledsoe County, the Bledsoe County Sheriff's Office was called to handle the case. The woman who was taken into custody on Smith Mountain has not been charged, Det. Lockhart said. A Dunlap Police Department vehicle drives out of the area with an unidentified woman in custody, who said she had been in the car officers were pursuing.